From humble beginnings of starting out playing local festivals as a duo, The Paper Kites, now a five-piece have come far – headlining their own international tour for the second time in America, Canada and New Zealand, and Australia. We were lucky enough to chat with Christina about how the band came to be, her obsession with Grey’s Anatomy, the lengths some fans will go to to honour the band, and what it’s like co-writing songs. 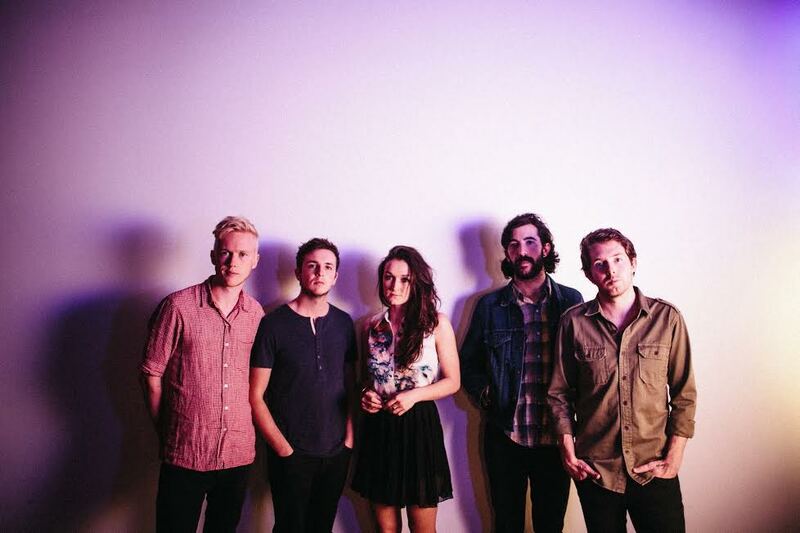 So, how did the name, “The Paper Kites” come about? We’ve actually been asked this a lot, and there’s not really much of a story to it. So Sam and I were (this was obviously years ago), accepted into playing at a local festival, and we sort of thought, “Uh maybe we should give ourselves some kind of name, because it probably sounds a bit more, I guess professional, than just Sam and Christina or something like that”. We’d never really done anything under the name of Sam and Christina, but we sort of thought it looks a bit better if we have some kind of name. So we started thinking about it and I think Sam was the one that came up with it. He just had a think about something that seems appropriate for the kind of music we were playing, and came up with that. Did you guys develop how you wanted your band to sound? I’ve heard a lot of people call it “ethereal” and “haunting”, or did the sound just organically manifest? I think originally you often end up writing music in the same reign as the people that you admire musically, or the kind of bands or the people that you’re listening to. For Sam and I early on, that was this genre, what ever it is [laughs], it’s the kind of stuff that we loved or were listening to at the time, so that’s probably what started us off in this kind of – I don’t even know what to call it sometimes – this folky feel. I think we kind of developed the sound just ourselves – obviously still being influenced by what we love and what we were listening to – but tried to develop it more ourselves, other than trying to sound like other people. What are some of your inspirations and influences that have developed that? Sound wise do you mean? I think you’re always kind of writing about things that you’re dealing with at the time, so I guess our personal lives influence what we’re writing about and influence the sound. We’ll usually write a song, or part of a song, and bring it to the band to workshop it together. To change things or just develop the sound together. When there’s five of you, you all have different tastes in music. That pushes us because people have different ideas and it pushes you to develop the music differently and try new things that you might not have thought of. I guess that’s the beauty of a band – that it’s not just you, sitting in your room having to write a song, but you’ve got other people that are challenging you and helping you to really develop it. When we do that, that’s when we get a sound that becomes The Paper Kites, other than just Sam in his bedroom writing songs. What’s it like listening to your own music on TV or on the radio? It doesn’t happen that often for me because I don’t listen to the radio heaps, but it’s still really weird, and I still find it really funny. It’s definitely not a normal thing, and it’s still really exciting hearing your song on the radio, or on a TV show or something. My boyfriend and I were driving (this would’ve been months ago) and he had Triple J on and one of our songs came on. At first I didn’t even realise because I know the songs so well, so I didn’t really think anything of it. We definitely still have those moments where it’s like a TV show that you really love and you happen to get a song on it or something that’s always super exciting. Yeah, I heard that Sam said you’re a big fan of Grey’s Anatomy, and that Featherstone was played on it. I was thinking if that was me I would’ve freaked out and been like OMG! Yeah! That was very exciting, I’m a massive grey’s anatomy fan. I don’t know why, though I feel like now everybody knows that I’m obsessed with Grey’s Anatomy, but that’s ok! [laughs] Yeah I love it, and the thing is that they have such an awesome soundtrack, I always have Shazaam out when I’m watching it, trying to work out who these songs are by because the music on it is always phenomenal! I always joked that that would be my ultimate… like it would be the best – It’s one of my band bucket lists. So when that actually happened I was ridiculously excited! Yeah! That would’ve been so cool! I read somewhere that you guys had over 40 songs ready to record for your latest album, and obviously they’re not all on there. So how do you decide which songs to include and which songs to cut? Yeah it’s really tricky sometimes, particularly when there’s five of you in a band and different people connect to different songs. For Sam and I there were a couple of songs that we were really adamant that this song has to be on the album – and it’s either a song that we’ve written or a song that you have a really strong personal connection to. That was it for me, there’s one song for me that I was like “that’s mine”. I had such a strong connection with it that I feel like it’s really important that it’s on the album. I think part of it is also hard when you’re trying to put 13 different songs on an album, you do have to take in consideration whether they flow together or not. That was something we really discussed so much, it was so hard trying to work out. Trying to find that balance – you don’t want all the songs to sound the same, but you also don’t want it to not flow and you don’t want it to feel jarring. You want it to be to some degree a bit of a journey through the album, so you do need to try and get it to flow a little bit so that it doesn’t seem confusing. For us, we know all the songs, so it’s not that confusing, but it’s hard. You do have to try to listen to it from the ears of someone that’s never heard them and make sure that it isn’t confusing I guess. You guys have an upcoming tour, how have you been preparing for that? We’ve been preparing the last couple of months, just kind of in the rehearsal studio really trying to stretch ourselves musically and creatively to try and keep it interesting for people who are coming to see us, and also for ourselves. Obviously since we released this album we’ve played these songs a lot of times. Like after our album tour here and then touring over in the States and Canada. Yeah, a big part is just trying to keep it interesting and keep it fresh. We’ve just been sort of slowly pulling things apart, putting them back together and changing things up a little bit so even for people that might’ve seen us every single time we’ve come to their city, it’ll still be fresh and really interesting. During the tour you’re playing an all ages show at The Enmore Theatre. How do you guys feel about that? Is it a good thing, a bad thing or a neutral thing? We love doing all ages stuff, it’s always really fun and when we’ve done under age shows or even all ages, there is a bit of a different vibe. Although it’s usually really fun because I think some of the underage people bring a lot of enthusiasm and we love that! It’s really good! Obviously most of our shows are over age, and we love that too! I think there’s different dynamics between an over age and under age show, and their both positive, neither are really negative experiences. So, yeah we’re really looking forward to it! It should be good! Do you find the crowd overwhelming when you’re performing? People often ask me “Do you still get nervous?”, and I’m like, yeah. [laughs] Definitely not as much as I used to! Very early on I used to seriously think I was going to be sick. Where as now I think generally it’s not overwhelming, it’s usually really exciting! When you’re playing a big venue, even if it’s not necessarily a big venue in numbers, but a beautiful venue like The Enmore, or somewhere that you’ve been really wanting to play. You’ve seen other bands there so you’re really excited to play there. It’s not overwhelming, like “oh I feel sick, I’m so nervous”, it’s really exciting! We’ve done a few shows over in America when we were touring with City and Colour that were really, really big and it felt like by the time we went on (because we were the only support) it was pretty much already full. I think I found that a little more overwhelming being in another country and playing to such a big crowd. What’s been your craziest fan encounter? Hmmm… Not too many crazy stories. It wasn’t a crazy thing, this was really nice so I don’t want it to seem like it was crazy! It’s always so nice when you know somebody’s obviously a really big fan! We’ve had a couple of people come up and show us tattoos they’ve got of our lyrics, or stuff like that. I remember in America [laughs], some guy had made me this amazing paper rose out of gold paper, he was there for City and Colour but he had been following our music for ages. He came up to me after the show and gave me this rose he’d made for me the day before, and it’s little things like that that are so awesome to think that somebody would go to the effort to make something for me! I don’t know, it’s just like “what? that’s so weird”, but it’s so lovely. We always love getting the opportunity to chat to people after the show and actually get to meet people and ask them about themselves. Yeah, we love doing that. So out of all the shows you’ve played, which do you think would be your favourite. That’s if you can choose [laughs]? Yeah, that’s a really hard question! [laughs]. Hmmm. Uhh. I think, yeah. I don’t know! [laughs] It would probably be one of the shows that we’ve done over in America, maybe. I have to say I can’t pick one favourite because there are so many awesome shows that we’ve had, and they’re all kind of great for different reasons! I remember in San Francisco, in America, we’d just finished the tour with City and Colour and this was the start of our own headlining shows over there. It was the very first show of our own headline tour, we had no idea how many people were going to come. I mean we had sold a decent amount of tickets, but we didn’t really know how many people were going to come and it ended up selling out! The crowd was just so awesome, and so enthusiastic. They were just so happy to be there, and we were so happy to be there! It was such an awesome experience because we had no idea what to expect, and it ended up exceeding our expectations ridiculously! It was kind of like this big test – the first show that we weren’t riding on the backs of somebody else. We were the headliners, so people were coming to see us! To fill up a room and have people be so attentive and so happy to have us there, we were just so excited to be there. So that was definitely a highlight! How is it different performing your own headlining shows, in comparison to supporting City and Colour on tour? It’s more pressure. When you’re supporting someone it’s kind of like you have something to prove, so you really want to nail every show because you’ve got people listening to you who might have never heard you before and you’re trying to show them that you’re worth listening to. So in that way, supporting is a lot of pressure. At the same time you get to play first, then you get off stage, pack up all your stuff and enjoy the rest of the night which is really nice. You get to go out and chat to people who have seen you and it’s really fun. Headlining has it’s pros and cons as well. It’s so awesome to know that all those people there have come to see you, I guess in that way it’s more pressure as well, because people have come just to see us. You want to make people glad that they came and feel like they’ve spent their money on something good [laughs]. So yeah, I think there’s pros and cons to both, but I guess these days, especially in Australia when we’re playing a headline show, it’s always awesome to go back to the cities that you’ve been in and see people that have been coming to see you for the last couple of tours. There’s something pretty amazing about playing your own shows and knowing there are people there that you’ve met. Do you have a favourite song? I know that you co-wrote “I Done You So Wrong” with Sam. Would that be one of your favourites? Yeah, that’s probably my favourite song. It’s definitely a personal song to me. Lyrically Sam and I spent like a whole day, literally, like that’s all we did – we sat there writing the lyrics, trying to work it out. I remember just walking around the room, we were down at this little house and were just writing. We were just walking around the house, just trying to figure out what I wanted to say. I think we said to ourselves, we weren’t allowed to eat dinner until we finished it [laughs]. So we just worked and worked and worked and nutted it out and it was really satisfying in the end, because for me it said exactly what I wanted to say. Yeah! There are other times when I feel like maybe I could say this better, or something like that. I feel like with this song we really got out what I wanted to say, and did it in the best way. I’m really happy with it lyrically and musically as well. It’s the last song on the album it’s got those beautiful strings at the end and I’m really happy with it. I mean, I love so many of the songs, but it’s definitely one of my favourites. What do you guys get up to when you’re not making music? We all work, either part-time or a couple of days a week. We have normal lives and hang out with our friends and family and partners and stuff. Then when we’re touring that gets busier and that’s when the rest of our lives kind of slow down. We don’t work as much, and we don’t see friends as much and stuff like that. Yeah, it can be hard to balance sometimes but I think we all manage it pretty well. The Paper Kites have two more shows in NZ on the 23rd and 24th of May, before they commence their Australian Tour on the 29th of May in Newcastle! Then they’re off to America on their second tour from the 4th of July!